With the Sun in Taurus (hedonist) and Moon in Scorpio (healer) –combining in a big, fat, full moon at 3:36 GMT – today is Nine of Cups day. 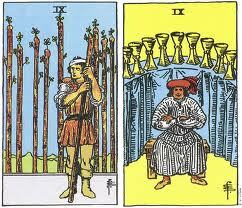 The Nine of Cups is an enigmatic energy. Although it looks pleasant enough, there’s more here than meets the eye. If you can come to grips with this, then you’ll do well with this energy. If not, forewarned is forearmed. You see a man with his feet planted far apart, cross armed, sitting in front of a tall table stacked with nine full cups. He wears a red hat with a red plume and red socks – red – the colour of blood – red – the colour of passion and desire. The man is smug and why shouldn’t he? The Nine of Cups reminds us to enjoy the good things in life. But sadly, he’s alone. Is there no one with whom he wishes to share his bounty? And why is the blue tablecloth so long? Is something hidden behind it? When dealing with this energy you must remember that Kabbalistically, the Nine of Cups falls under the influence of the sefirah, Yesod, which is associated with the Moon and the watery flux and reflux of the unconscious. Yet as Dion Fortune reminds us in The Mystical Qabalah, Yesod also represents the foundation of the universe, established by great strength such as found in the Nine of Wands. Fluid foundations? How could this be? Fortune reminds us that if one likens the kingdom of earth to a great ship, Yesod would be the engine room. Because it partakes both in the nature of mind and matter, Yesod is the all-important energy with which one works all magic designed to take effect in our physical world. Desire – underlying as it does all magical work – comes as much from your unconscious as from your conscious – indeed – perhaps even more so. Therefore the trick to dealing with today’s energy is to carefully examine – and re-examine – that which you desire and why – before reaching out for it. For as with the man in the Nine of Cups – it is your unconscious – hidden from view behind the blue tablecloth – that drives your truth – red hat and red socks notwithstanding. Thanks so much – thinking of writing a book = an astrology almanac of sort – using this type of format.